Spray 11x7-inch microwavable dish with cooking spray. 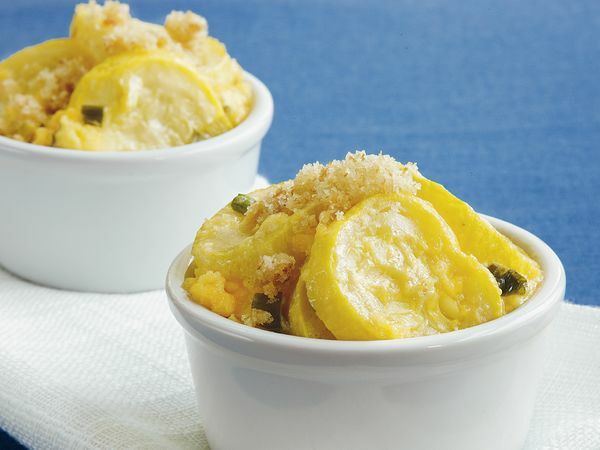 In large bowl, stir together mayonnaise, eggs, flour and salt; stir in squash mixture and cheese. Spoon mixture into baking dish. Cover tightly with microwavable plastic wrap, folding back one edge or corner 1/4 inch to vent steam. Microwave on High 10 minutes or until set; let stand 10 minutes. In small microwavable bowl, mix bread crumbs and melted butter. Microwave on High 2 minutes. Sprinkle over casserole or over individual servings.